There is evidence that drugs produced in Colombia continue to pass freely through Venezuela’s border. Following the demobilization of the Revolutionary Armed Forces of Colombia (FARC), trafficking routes are now under the control of several new criminal groups. In August last year, for example, experts pointed out that another Colombian rebel group, the Popular Liberation Army (EPL), has established a presence in Venezuela for the first time this year. The Rastrojos, once one of Colombia’s most powerful criminal groups, have also begun to emerge in Venezuela after practically disappearing in their home country. The role of Venezuelans in trafficking drugs through the Caribbean has also grown, as observed in the Dominican Republic. Venezuelans are now replacing Colombians as drug mules and speedboat operators. 2017 also laid bare Venezuela’s role as a base for drug flights. 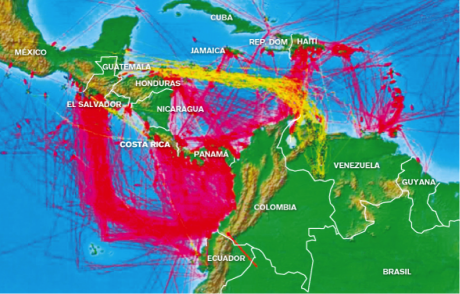 In May, InSight Crime reported on a map presented by Costa Rica Security Minister Gustavo Mata Vega that illustrates cocaine trafficking routes through Central America. The yellow lines on the map, which indicate aerial drug trafficking routes, clearly show that Venezuela is the main starting point for flights headed mostly to Honduras and Mexico. “Venezuela, unfortunately, is now a failed state and narco regime”, Mike Vigil, a retired Drug Enforcement Administration (DEA) agent with decades of experience in Latin America, said in August - just two days after National Assembly elections strengthened the Maduro administration’s power. With the support of the National Assembly, Maduro was largely able to overcome political conflicts in 2017. However, in moments when the administration appeared to be weakening, it clung to power with mano dura - that is, iron fist repression of political protests and the continuation of a controversial security initiative known as “Operation Liberation and Protection of the People” (OLP). The OLP security strategy led to more than 500 killings by security force officials, in addition to reports of torture and other human rights violations. In January, Maduro announced a new package of security measures in which he proposed arming civilians in the fight against organized crime. Although no evidence ever surfaced indicating that the government actually provided these arms, the administration has relied on armed civilians’ colectivos. The government has allowed these collectives to use force and some have participated in official security operations. The colectivos are also known to engage in a variety of criminal activities. The Maduro administration’s hard-line security policies appear to have contributed to a stabilization of the political sphere ahead of the year’s end. However, the iron fist approach has not had any significant impact on crime reduction. In 2017, there were more than 20.000 homicides, according to estimates, a figure that comes close to that of 2016, when the Attorney General’s Office registered 21.752 homicides. This represents a rate of 70 homicides per 100.000 citizens, one of the highest in the region. 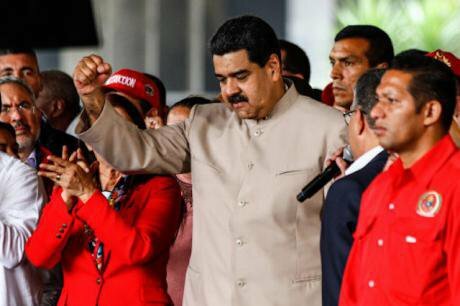 International sanctions against government officials, including President Nicolás Maduro, have failed to weaken the regime’s power and have helped solidify its leaders’ ties to transnational crime. The US Treasury Department’s Office of Foreign Assets Control (OFAC) sanctioned more than a dozen current and former Venezuelan officials in February and July 2017. Venezuelan Vice President Tareck El Aissami was perhaps the most high profile official included on the OFAC list. The US Treasury Department sanctioned El Aissami for his alleged involvement in drug trafficking, making him the highest-level government official to be accused of this crime. He has also been implicated in a “criminal-terrorist pipeline” allegedly involving militant Islamists and the transfer of illicit funds and drugs to the Middle East. El Aissami’s assets and those of his business frontman Samark López Bello, were frozen by the US government, for “providing material assistance, financial support, or goods, or services, in support of the international narcotics trafficking activities of, and acting for, or on behalf of, El Aissami”, according to the press release announcing the sanctions. Nonetheless, both individuals have continued their activities. In fact, the sanctions did not affect their ties to organized crime. López remains in the business of importing food products for the government’s nutrition program. As vice president, El Aissami has gained more power. During the October elections for governorships, El Aissami helped place several of his allies at the helm of key states for drug trafficking and other criminal activities, such as Sucre and Aragua. The state of Aragua, where El Aissami served as governor and where one of his allies was recently elected, is also the base of operations for the Tren de Aragua, a heavily armed megabanda, a huge gang run from inside the Tocorón prison. Another wave of US sanctions came in late July 2017 amid political protests. These sanctions included President Nicolás Maduro, whom the US Treasury Department described as a “dictator”. In December, two of Maduro’s nephews were sentenced to nearly two decades in prison by a US court for plotting to ship 800 kilograms of cocaine to the United States. Among the other officials sanctioned at this time was Néstor Reverol, the former head of Venezuela’s anti-drug agency and a former commander of the Bolivarian National Guard (GNB). In August, just one day after US federal prosecutors unsealed an indictment accusing Reverol of participating in a transnational cocaine trafficking network, Maduro appointed him Interior Minister. Reverol is also one of El Aissami’s staunchest supporters. Former Prison Minister Iris Varela was also among those sanctioned. Varela has been accused of helping criminal networks to flourish by allowing inmates to control the country’s prisons. In May, Varela admitted that she called on inmates to “neutralize” a violent riot in their prison that left at least 9 dead. Multiple cases have illustrated the magnitude of control exercised by inmates in the country’s prisons. In an investigation published in September, InSight Crime described the power of the pranes, or prison gang leaders, and their ties to organized crime: “Ironically it seems the pranes run a more efficient government than Maduro. Justice is swift, and while food is scarce on supermarket shelves, the pranes seem able to get all the food they need”. Militarization has been a constant feature of the administrations of former President Hugo Chávez and his successor Maduro. The current administration set a record by appointing 12 military officers to positions as ministers, the most of any Venezuelan cabinet in the last 17 years. In July 2017, Maduro appointed Generals Carlos Osorio Zambrano, Juan de Jesús Toussaintt and Luis Motta Domínguez to join his cabinet. These generals have been accused of involvement in the trafficking of food, drugs, gold and diamonds. “The ongoing militarization of the Venezuelan state is worrying, given that the country’s security forces have lost much of their legitimacy due to widespread criminal activity within their ranks,” InSight Crime wrote following a cabinet reshuffling in June. In a March 2017 report, former judge and drug czar Mildred Camero described the evolution of military involvement in drug trafficking and identified high-level officials allegedly participating in the criminal activity. The trend of militarization does not bode well for the country’s high levels of violence, which include reports of human rights violations committed by security forces. As InSight Crime wrote in June, “reports indicate that the government’s policy of involving military elements in the fight against crime has engendered repeated cases of extrajudicial killings. As 2017 came to an end, Maduro and those around him had become even stronger. Vice President El Aissami, who is now one of Maduro’s closest confidants, announced that his boss will run for reelection in 2018. Ahead of the election, Maduro has made further changes to his cabinet, appointing more military officers to top positions. With the help of these military officials, Maduro hopes to shield himself and protect the fragile hold on power that has characterized his administration. Maduro and El Aissami have appointed trusted soldiers, mainly from the National Guard, to key posts. The National Guard is one of the main branches of the military allegedly involved in the Cartel of the Suns, shadowy groups within the country’s armed forces tied to cocaine trafficking and other criminal activities such as the contraband smuggling of gas, minerals and food.